Easy Gluten-Free. Seasonal Recipes. Travel. 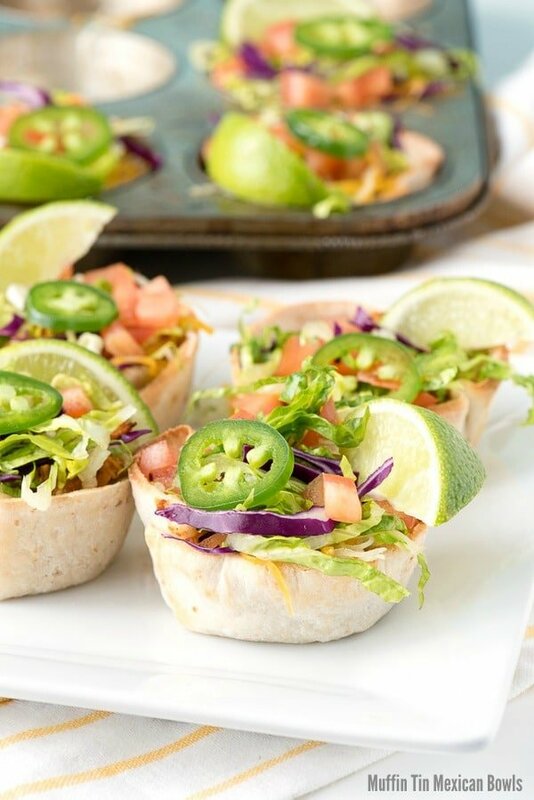 Muffin Tin Mexican Bowls are a great weeknight dinner with shredded chicken, refried beans, salsa and cheese, topped with fresh taco toppings. Perfect for single portions or party appetizers! This post is sponsored as part of Boulder Locavore’s ongoing partnership with Udi’s Gluten-Free, exploring gluten-free recipes, health and wellness. I can’t think of a food I love more than Mexican food. I have distinct memories of tasting it for the first time when I was a child and feeling I’d stumbled into a wonderland of exotic smells, spicy flavors and the comfort food of my dreams. That has stayed with me and is my go to for dinner often! When I became gluten-free, traditional Mexican cuisine was not off the table with the exception of anything using a flour tortilla and some sauces which use wheat. I’m happy to bob and weave around that, loving the food so much and being willing to find any way I can enjoy it safely. Recently I’ve been enjoying experimenting with Udi’s Gluten-Free Tortillas which are not wheat but the gluten-free equivalent of a wheat tortilla in texture. 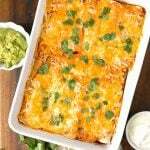 I shared a mouthwatering Mexican Breakfast Chicken Tortilla Casserole recipe last month which used them and I still find myself dreaming of a steaming slice of it on chilly days (or, any day really). Today I had fun creating Muffin Tin Mexican Bowls; perfect single portion tortilla bowls filled with tasty refried beans, shredded chicken, salsa and cheese. 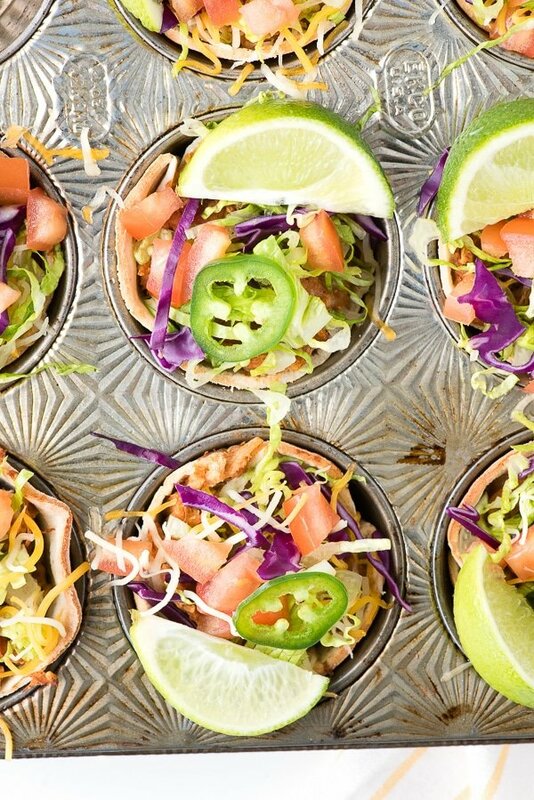 They are crowned with usual taco toppings of crispy shredded lettuce, finely diced tomatoes, more cheese, a bit of red cabbage for color and crunch (optional), a jalapeno slice and a lime wedge to drizzle on the tiny bowl. You could add a dollop of sour cream too! You control the heat level with the salsa you use in the filling mixture. I personally love salsa with chipotle, loving the sultry, smoky heat and used a mild heat option. Selecting refried beans with some seasonings in them too builds on the flavor. Despite being diminutive, these Mexican bowls are filling. One or two as a main portion with some sides would be great for a meal. They would be perfect additions to a brunch buffet or football party too. They are quick to make and cook. I love their colorful appearance and great flavor! To make this delicious Mexican dinner, you will need at least one 6-cup muffin tin. There is something about shrinking food that makes it all the more enticing. 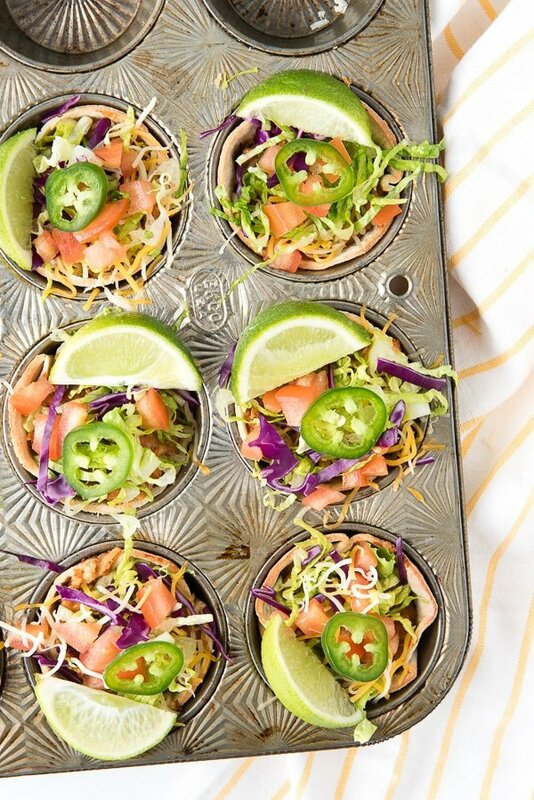 These Muffin Tin Mexican Bowls are no different! 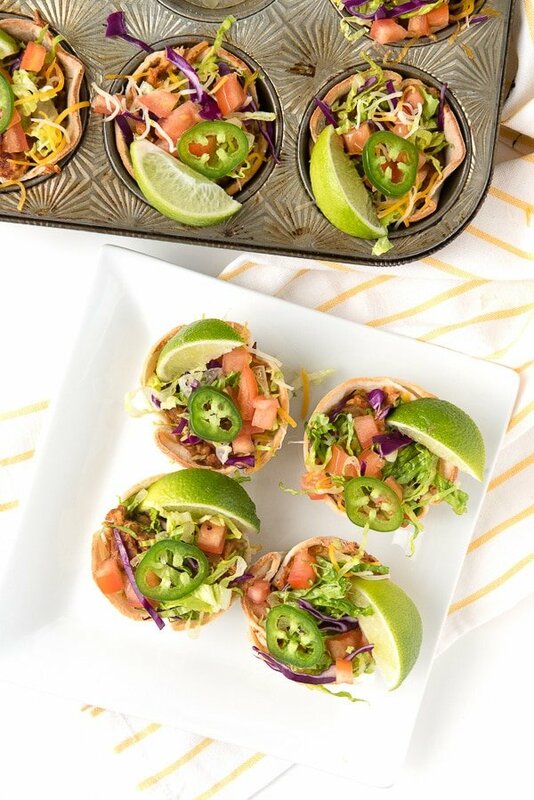 Tortilla-lined muffin tins are filled with chicken, refried beans, salsa and cheese; then topped with lettuce, tomatoes, jalapeno slices and a squeeze of lime. Perfect for a main dish (2-3 per person) or an appetizer buffet. Gluten flour tortillas may be substituted. Preheat the oven to 350 degrees. Prepare a 12 muffin tin (or two 6 muffin tins) by spraying with non-stick spray. Cut each tortilla to be 4-inches in diameter with a round cookie cutter or the rim of a large glass. Wrap a cut tortilla in a damp paper towel and microwave on high for 15 seconds. Place the tortilla in one of the prepared muffin cups and gently push down to line the muffin cup. The tortilla will overlap on the sides (refer to photo). Repeat to line all the muffin cups. In a medium-size microwave safe mixing bowl warm the refried beans for 20 seconds until they are soft and stir into a smooth consistency (they do not need to cook just become workable). Add the chicken, salsa and cheese and stir to fully incorporate. Evenly divide the mixture spooning it into the lined muffin cups. Place in the preheated oven for 15-18 minutes until the edges of the tortillas begin to turn golden. Remove from the oven and allow to cool for a few minutes. 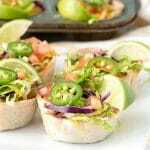 Gently remove the mini Mexican bowls from the muffin tins and top with some lettuce, cheese, tomato, cabbage (if used; mainly for color and crunch) and serve each with a lime wedge for squeezing on the mini Mexican bowl. This is a sponsored conversation written by me on behalf of Udi’s Gluten Free. The opinions and text are all mine. Toni Dash, is the writer/blogger, photographer, recipe developer and creator of Boulder Locavore®. She has been developing easy to make, well-tested recipes since 2010. 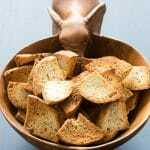 Her seasonal recipes bring excitement to the dining table for both gluten-free and gluten diners. Toni has been featured in numerous publications and on culinary websites for her creative, delicious recipes and travel features. For more details, check out her About page. Learn my tips, recipes, and strategies for making mealtime easy. Disclosure: This post may contain affiliate links. To learn more check my Disclosure page. You make the most fun food, Toni, these are so cute! Not having access to flour tortillas would be a very sad thing for me. I use them for just about everything and would miss them more than bread if I had a gluten intolerance. Thank goodness you have another option now! And a BIG thank you for coming up with the muffin cups. They look fantastic. So good to hear from you Christiane! Fortunately corn tortillas are gluten-free so have been a mainstay for our family but nothing really replaces a flour tortilla, does it? We are delighted to step back into the world of full access Mexican food with these flour tortillas! Now that’s the way to fill a muffin pan. This sounds great! Love these, Toni! They’re like perfect little salad cups, but with a healthy carb and protein dose. They sound scrumptious! These tortilla cups look pretty and yummy. I am going to have to give this recipe a try. Wow this looks fabulous. I would love to make these up. It’s so different than what I’m used to, I’m sure my husband would even be all for these. They look great! I am always looking for new glutten free recipes to make. I will have to get the ingredients i need to make this on the weekend. I am a huge fan of Mexican food. I have a feeling these would be a hit at the next dinner party. Look yummy. Wow, these look really good. I can see this being really fun spring and summer apps or sides. I like this recipe – my husband is a fan of spicy food. And we both like Mexican food in general. This sounds really good! We love Mexican food and love that it is so easy for my daughter who has celiac disease to enjoy. These look so yummy. They will make a great snack for the big game this weekend. Oh Yum!! My family eats mexican usually once a week so I will have to try these! They are perfect for the Super Bowl! They are quick to make and more filling than you’d guess too! Those look so yummy! 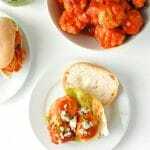 I love making delicious meals that are also easy, and this is just about the easiest recipe I’ve seen. Those look fantastic! I love all the flavors, and making this recipe in a muffin pan was pure genius. Love these. We are BIG Mexican fans in our house, so my family would devour these. Boulder Locavore is a participant in the Amazon Services LLC Associates Program, an affiliate advertising program designed to provide a means for sites to earn advertising fees by advertising and linking to Amazon.com. Subscribe to email updates to get your FREE recipe ebook! !Click Me! !